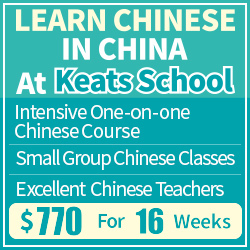 A quick search on online offers a plethora of different websites, programs, apps and services that all promise to teach you Chinese characters. However, over the years, I’ve found very few products I want to recommend to others. Skritter is one of them; welcome to my Skritter review! I started using Skritter about a year ago and I have been using it regularly ever since, with only occasional periods of laziness when exams and major reports are due. To put it very briefly, Skritter is an app (for your phone or computer) that allows you to practise writing Chinese characters by hand. Not unique, you might say, but wait, It offers you feedback on your writing! Skritter is a spaced repetition software, which means that it will serve you the words you need with carefully calculated intervals to maximise your learning efficiency. Which words you actually study is up to you, of course. You can add your favourite textbook or just interesting characters you want to study. Unlike any other software I know, Skritter tells you if you’re correct or not. It will guide you through the standard stroke order and character composition if you forget how to write a character. If you write a stroke in the wrong location or direction, it will tell you so and show the right way of doing it. Skritter has a freely available scratchpad where you can write any characters you want. Try writing Hacking Chinese with characters here! I will go into more detail below, but before I do that, I’d like to state the main reason I’m recommending Skritter. I’m a fairly advanced student by now, but even if I’m enrolled in a master’s program taught entirely in Chinese for native speakers, I still use a computer to write Chinese 99% of the time. This is very bad if you have in-class exams that require you to write long answers by hand. I’m also a teacher of Chinese and as such, I need to remember how to write characters by hand. I also think that knowing how to write characters is an important part of knowing Chinese, but that’s my personal opinion and not something I’m going to force either on you or my students. The reason I want to recommend Skritter is that it’s part of the most efficient solution to build and maintain the ability to write Chinese by hand. Most foreign adult learners can’t walk the long road to written proficiency and mimic the learning process of native speakers. That requires more than twelve years of language heavy education (grades 1-12) and most of us neither want nor have the time for that. I believe that Skritter, mnemonics, sensible character learning and communicative writing is the way to go. Another important point any Skritter review should bring up is that it’s fun and not a little addictive. It’s probably bad to be addicted to StarCraft 2 (even if you play only in Chinese) if you have tons of other things you ought to do instead, but being addicted to learning characters is great! Learning should be fun and Skritter is definitely more fun than writing lots of characters on a blank sheet of paper. Part of the fun is that Skritter offers direct feedback and measurable progress. It’s not a game, but it feels like one at times. How many characters can you learn this week? Can you you get the number of correct answers higher than last week? Skritter review: Who is it for? Of course, you can write character with your mouse or a trackpad or whatever, but I feel that that defeats the purpose of handwriting. If you plan to use your computer, buy a writing tablet (it’s not that expensive). If you have a smartphone, use that. Having vocabulary in your pocket is great! I would say that Skritter is equally useful for beginner, intermediate and advanced students, or at least I find it very useful now (I know around 5000 characters) and I would be very happy if I could send Skritter back in time to when I started learning Chinese. However, if you are a complete beginner and study only traditional characters, I don’t recommend using Skritter until you know more about strokes and character composition. The app is mostly geared towards the mainland and simplified Chinese. Of course, it has a traditional version, but there are some problems. For instance, the pronunciation is always Mainland Chinese and you can’t change that, not even manually. This will be very confusing for beginners in Taiwan. Once you have reached a more advanced level, you probably want to learn both anyway. The goal with this article isn’t to publish Skritter’s feature list or manual, so rather than talking about how the program works, let’s have a look! Here are a few videos that show you how it works much more effectively. 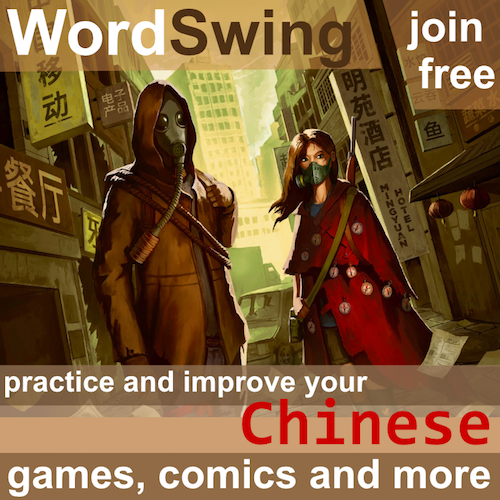 Apart from the core functionality of Skritter, there are a number of useful features, including user-created vocabulary lists, mnemonics you can share with others, detailed statistics of your own studying (key for the game-like feel), example sentences and an excellent blog about learning Chinese. How do I use Skritter? I only use Skritter for handwriting. I think Anki is a superior program when it comes to SRS in general. However, if you want to keep everything in one place, then of course you can use Skritter for learning tones, definitions and so on, too. How should you use Skritter? The obvious way of using Skritter is to supplement your normal studying. You can probably find the vocabulary to your textbook online (it’s probably already available in Skritter) and that’s a logical place to start. You can download Skritter from the official website and use it for free for a week. You can then keep using the service for free, but if you want to add more words, you need to subscribe. In other words, you can keep reviewing what you have already learnt for free forever. Coming from Anki (another spaced repetition software), I must say that the vocabulary browser and editing functions are too limited. In Anki, you can do almost anything you want, but in Skritter you’re limited to using the built-in interface. To be fair, Anki is unique in this regard and most other vocabulary services have interfaces on the same level as Skritter. Skritter is a really useful app. It’s part of the most efficient way of learning characters that I know of and I wish that I’d started using it earlier. It’s a valuable resource for anyone who wants to boost their character knowledge, including the full range from complete beginners up to Mandarin teachers. Skritter is a program I use daily and I think it’s likely to remain so for a very long time! I think Skritter is great! I don’t think that I would pay for it myself, though (my University pays at the moment). Due to my small amount of disposable income, it wouldn’t really be feasible to pay for both ChinesePod and Skritter, and I’d choose ChinesePod any day. I do use Skritter, though, albeit not religiously. I generally prefer to just listen and read, beacause, although this may lack somewhat in efficiency (this is also debatable), I find it more fun. What I can say about Skritter is that, in my experience, unless I actively write out characters I get wrong on a physical piece of paper – there’s no way I’m going to learn them. New characters, too, generally need to be written out by hand at first, but can then be consolidated with Skritter. Skritter obviously has a huge advantage in terms of convenience, in that it is not always practical to whip out a notebook and pen and start scrawling away. Olle, do you have a regular time every day you devote to Anki and Skritter? Or do you just use them whenever you get a chance? It sounds to me like you don’t need Skritter! If you do mostly listening and recognition, you could use free programs like Anki, who apart from being free are superior in other ways (but don’t have handwriting). To answer your last question, no, I don’t have any specific time for using Skritter or Anki, I do it whenever I have some time to spare. My main problem with Skritter, it currently for me only works as a refresher. I cannot “learn” via Skritter the setup on the iPhone is just not equipped for that IMO. Going through the “information” going to example sentences in Pleco is just not feasible. I wish it was there in the screen already! like the webversion! Olle, I may have missed it somewhere, but how do you use a touchscreen to write on the web version? This sounds like a flaw in the app, I suppose. In the web version, you have most of the information you need displayed to one side and you can see some of it before you answer the question and all of it after. Works pretty well! I’m using a writing tablet, Ubuntu and Chrome for the web version. Used Skritter every day for almost a year now. 1 hour a day on average, worked through Heisig books 1 and 2, learned to write 3000+ simplified characters in 1 year, with 80% recall rate. Recommended. Skritter was also very good in learning stroke order overall feel of the characters – my writing on paper is much clearer and better looking now, and I have a pretty good feel for the correct stroke order of new characters I meet. I was making quite a few mistakes at first, and Skritter chips away at them with constant reminders. BTW I believe all Windows 8 touch screen devices will work with Skritter web version – I have used the Surface RT for example, which works fine. I use Skritter for Japanese and can highly recommend it for that as well. I only use the iOS version, usually on my iPad. It does have a bit of issues with stroke recognition sometimes. Sometimes it’ll be much too strict in accepting a stroke, requiring me to redo it when it was actually fine, and sometimes I’ll make a stroke that’s completely wrong and it’ll auto correct it and blithely carry on. But you get used to the quirks and they mostly don’t get in the way. I use a Nomad brush stylus. I’ve found this to be much superior to writing with the fingertip. It does a pretty good impression of writing with brush and paper. That brush is a bit big for the iPhone screen though; I wish they made a fine tipped one. I’m working my way through Remembering The Kanji again, using Japanese keywords. (I shared the list on Skritter if anyone else wants to as well.) I’d been trying before with Amki and brush and paper, but didn’t get past about 300 words – now after using Skritter for about two months I’m over half done, well over a thousand words in. It really is the answer for learning characters. I should have mentioned the strictness/leniency in the article. For instance, 巛 is extremely hard to write in a manner that is acceptable by Skritter, while some other strokes can be completely off, placed incorrectly and in the wrong direction, and the program still accepts them. This is why I suggest people use the “raw squiggle” function so you can’t cheat by looking at what the computer guesses that you want to write. The defects of Skritter – that it is only an effective solution on Apple products (which are both overpriced and extremely poorly integrated with most computer users’ desktops) and the way that full-form characters are inadequately handled – made me decide not to use Skritter. I’ve looked in vain for an improvement, but none has ever looked like appearing. There are alternatives, both for a range of platforms and for full-form characters. Skritter is a bit like Pleco: it’s widely praised by people who happen to fall into the categories it’s designed for, but if you have other needs, you won’t be satisfied. Your two main complaints – that you couldn’t find an option for traditional-character-only and the interface felt too cluttered – can actually be addressed pretty well by settings (the first one certainly can), and if there’s something else you find lacking, we’d love to hear about it so that we can try to improve on it in future updates. 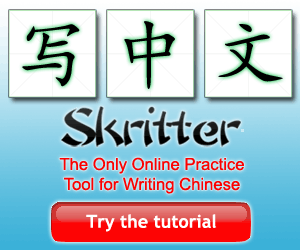 Skritter looks like it is finally taking the Chinese user interface for writing to the next level…. integrated for the whole universe of input devices. I have been hanging onto a Palm Zire72 with Pleco Dict for ages as it was one of the few good early user interfaces. They have kept up and moved to iPad, iPhone, and Android platforms… but one has to own one of those devices to reach the WWW in Chinese. If Skritter can break out of the Apple product box, it may be very appealing to a wide audience. With the old Palm Zire72, I’ve been shut out and have to go to other methods to create Chinese input on the Internet… all rather tedious: BPMF, Zang Jie, and a special pen pad. Sadly, I am NOT interested in becoming an Apple product dependent user. I’ve even given up Windows, and turned to Linux. So I get I will have to struggle with what I have. I feel much the same as you do. I mostly use the web version of Skritter, which works fine in Chrome on Ubuntu. 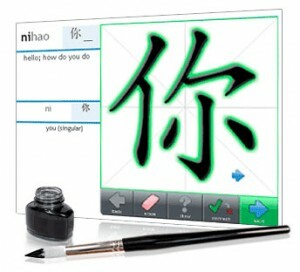 1) Encourages learning to write Chinese! Nice, we need as many folks and tools for this as possible! The more the merrier! 2) Includes proper stroke order information for each character. 1) Free hand writing is paramount to learning to write Chinese or any language for that matter. Replacing my hand writing with pre-built standardized animation is not a win for me. No hand written character looks like that and it is essential to master the size, shape and proportion associated with true free hand writing. Likewise the model character is a stock image, not the real hand writing of an actual Chinese person. All the best to the Skritter folks though and great job on encouraging/helping others to learn to write Chinese! Particularly is your hypothesis above accurate, would it really take “more than twelve years of language heavy education” for an adult learner to use the “the Chinese method” of learning to write charcters? hmmmm…. I don’t agree that Skritter is hard to use. It takes a few minutes to figure out how things work and most is intuitive. You just register, choose a word list and start studying/reviewing. Sure, there are many other things you can do, but the very basics aren’t that hard to figure out. Of course, the cost is a major disadvantage for people on a tight budget, but I think we need to accept that programs like Skritter will cost money. I have enjoyed your posts. 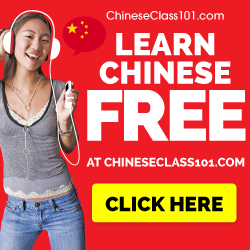 In fact it has inspired me to blog about the approaches I have used (tried) in learning Chinese and (unlike your website which only reviews what it recommends) I will review everything I have tried. Books, CD/DVDs, web-based approaches, Skype instructions, SRS, etc. There are a lot of excellent ways to go about studying Chinese and frankly the problem for adults (especially those who, like me, work for a living) is the time commitment and prioritization. 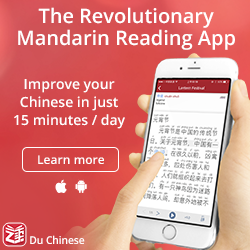 Sure, I like Chinesepod, but I also like Anki, Skritter, and many other books and lesson materials. I do always seem to have time to read your observations. Thanks, maybe once I get a few more things reviewed it will be worthwhile for some people (especially beginners) to benefit from my misadventures in learning Chinese. Keep up the good work. Let me join the request for an android version and raise awareness to this request. Hopefully will convince the amazing skritter team to do it. Why Skritter App Makes me Spend $518.49? I use Skritter on Android. After downloading Flash as described here, the website works! It’s somewhat awkward on the phone but better than having to use a mouse all the time. I was under the impression that it was quite hard to get flash to work at all on some Android phones? Perhaps that’s been fixed, but it didn’t work for me when I tried it a while back. Might be, I don’t have any experience other than with my own phone (Droid Razr with Android 4) which worked when I installed the update. I gave it another try and actually succeeded in getting it running, but it’s so slow that it’s not fun. I write perhaps ten times faster using a writing tablet. Still, if I don’t have my computer and writing tablet around, this is a good backup! You can use Inkstone ( https://www.skishore.me/inkstone/ ) and it is free. It has the main features of Skriter and the HSK wordlists. So no need to pay for that.